Chinese orbital launch vehicle. 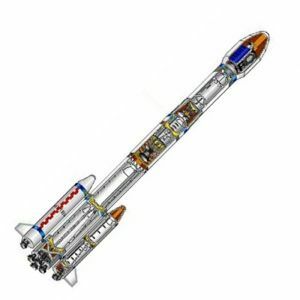 The Long March 3B was the most powerful Long March launch vehicle. It could inject a 5,000 kg payload into geosynchronous transfer orbit. The CZ-3B was developed on the basis of the CZ-3A, but had enlarged propellant tanks, larger fairing, and four boosters strapped onto the core stage. The CZ-3B boosters were identical to those of the CZ-3A. AKA: Chang Zheng-3B;CZ-3B;Long March 3B. Status: Active. First Launch: 1996-02-14. Last Launch: 2019-01-10. Number: 29 . Payload: 11,200 kg (24,600 lb). Thrust: 2,980.00 kN (669,930 lbf). Gross mass: 425,800 kg (938,700 lb). Height: 54.80 m (179.70 ft). Diameter: 3.35 m (10.99 ft). Apogee: 200 km (120 mi). LEO Payload: 11,200 kg (24,600 lb) to a 200 km orbit at 28.50 degrees. Payload: 5,100 kg (11,200 lb) to a GTO. Launch Price $: 70.000 million in 1999 dollars. Stage 0. 4 x CZ-2E-0. Gross Mass: 41,000 kg (90,000 lb). Empty Mass: 3,200 kg (7,000 lb). Thrust (vac): 816.285 kN (183,508 lbf). Isp: 291 sec. Burn time: 128 sec. Isp(sl): 261 sec. Diameter: 2.25 m (7.38 ft). Span: 2.26 m (7.41 ft). Length: 15.33 m (50.29 ft). Propellants: N2O4/UDMH. No Engines: 1. Engine: YF-20B. Other designations: LB-40. Status: In Production. More at: Chang Zheng 3B. Family: orbital launch vehicle. Country: China. Engines: YF-25/23, YF-20B, YF-75. Spacecraft: Apstar, Beidou 3, FS-1300, Spacebus 3000, AS 2100, Spacebus 4000, DFH-4. Projects: Chinastar, Intelsat, Sinosat. Launch Sites: Xichang, Xichang LC2. Stages: CZ H-18 stage, CZ-2C/SD-2, CZ-3A-1, LB-40. Agency: CALT. Cutaway view of LM-3B launch vehicle.